One of our favorite activities while traveling is to locate tearooms and have afternoon tea where we have not been before. 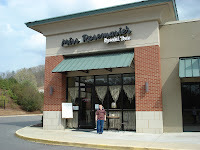 We stopped at Miss Rosemarie's Special Teas Salon & Shoppe in Birmingham on our way to Mobile. 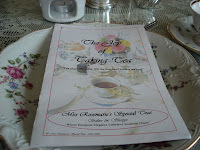 Miss Rosemarie's is a "European-style" tearoom. In addition to lunch Monday - Saturday, they serve four afternoon teas, including Miss Rosemarie's Special Tea, Nancy's Full Tea, Edna's Cream Tea and Abby's Dessert Tea. AJ, GJ and I ordered Nancy's Full Tea, a three course tea. 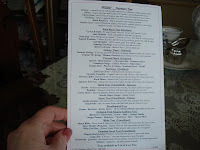 Miss Rosemarie's has a very nice selection of over 60 loose leaf teas. Each of us chose a different pot of tea. Supreme Earl Grey for AJ, English Breakfast decaf for GJ and Silver Needles White for me. 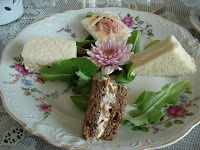 The first course of the full tea, was four tea sandwiches, a carrot olive mascarpone on dark bread, almond chicken salad, Swiss cheese (melted) with apple and an open faced ham with chipotle cheese. The second course, the scone of the day, was a delicious apricot scone served with mock Devonshire cream, jam and lemon curd. (I forgot to take a photo.) 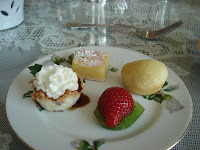 The last course included a chocolate macaroon tartlet, a mini butter cake with orange glaze, a lemon square (AJ's favorite) and a kiwi slice with 1/2 a strawberry. The price for Nancy’s Full Tea was $14.95++ per person. We enjoyed the respite of afternoon tea then headed back out in the trafffic to continue our journey to a lovely Victorian B & B for the night. Birmingham is not that far from me (hour and a half, maybe? ), so I am delighted to find your review! Thanks!